Have you been waiting on Mac OS X Lion because you don’t have a broadband connection or the bandwidth allowance to make the required 3.5 GB download a realistic possibility? Then today is your (sort of) lucky day. 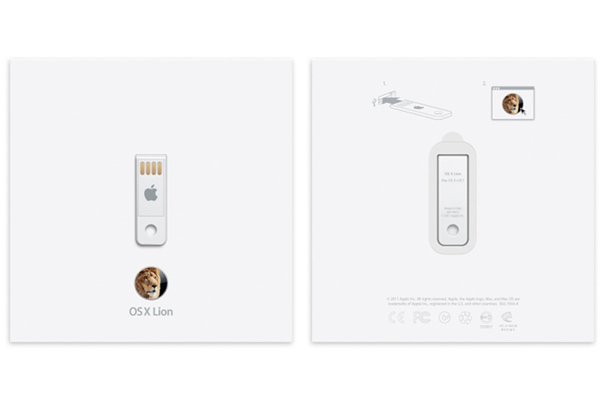 Apple (s aapl) introduced the OS X Lion USB Thumb Drive to the online Apple Store early on Tuesday morning, but it comes with a premium price tag: $69. The tiny flash drive carries a full copy of OS X Lion so that you can install and reinstall OS X and access disk utility without an Internet connection. This could come in handy for customers who feel left out of Apple’s bold new future of digital-only distribution. Still, $69 is a lot to pay for a product that Apple is selling for $29.99 on the Mac App Store. But Apple likely has at least a couple of very good reasons for charging more: First, the cost of a wide-distribution physical format probably wasn’t factored into Lion’s pricing prior to launch, and second, Apple would much rather customers shop through the Mac App Store, since it clearly has a lot invested in the idea that digital distribution is the future (that’s the whole point behind the Mac App Store, after all). At least users can take comfort in the fact that the thumb drive version of Lion carries the same far-reaching licensing conditions as does the digital version, meaning you can install OS X on any “Macs you own or control running Mac OS X Snow Leopard or Snow Leopard Server.” Just note that if you install Lion using the USB drive, you won’t be able to use Lion Recovery to reinstall your system. What do you think of the Lion USB drive and its price tag? Is the licensing tied to an Apple ID, or is like the old “Famliy Pack”? Meanwhile, I’m still waiting to be able to redeem the Lion upgrade on my two day old MacBook Pro. This digital-only distribution has been a failure.